Stairplan is a long established company that has grown into the company it is now, we moved into our current workshop in 2001 but were based at our Dawley workshop for many years before. These pictures show our Dawley premises which we used to produce our Sure Grip anti slip surface after we moved to the Stafford Park Premises. Sure grip is a anti slip surface developed by Stairplan a number of years ago, we now no longer produce this ourselves but we do still supply the product if requested. The workshop at Dawley was around 2500 square feet the photo above shows part of the workshop in quite an aged state not long before the move to Stafford Park. This Photo shows another angle of the Dawley workshop, again this is not long before the move to stafford park, you can see our old Ryburn Pickles Stair Trencher, a wadkin overhaed router, a Sanding Master Wide belt sander and a strebig Wall saw. 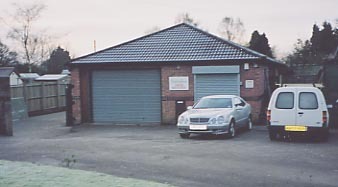 You can see that we had far outgrown this facility in 2001, at this time we were still a fairly localised company working localy in Shropshire and only travelling any distance for certain projects taken on by our existing client base.